You’ve been thinking about it, but not sure if you’re ready. Maybe you’re thinking about selling, but in the back of your mind you’re wondering what would happen if you rented it instead of selling. Maybe the market is just not right at the moment to sell. Whatever the reason, there are a few crucial questions to consider and answer before you make your final decision. There are many great reasons why you should put your house on the rental market. If you’re one of those property owners who are pondering whether to sell or rent their property, there are several reasons you should consider to finally make your decision and rent it. Convert your home into an asset. While your primary home is a necessity for life, it is typically a liability and not an asset. An asset is something that will generate money or income, while a liability is something that costs you money. Easily convert your liability to an asset by renting. It will pay itself off. If you decide to rent your house, your tenants will help pay off your mortgage while still keeping your house. At the same time your tenants are practically paying off your house, the market will hopefully rise and help you build up your wealth for your future. In excellent cases, the rent will surpass your costs and now you’re looking at a positive monthly cash flow, which in reality is every landlord’s goal. Start your investment career with no additional cost. Many career investors begin this way. Since you already own the home, you do not need any starting capital. This is a known error free method to start building wealth. Think way ahead in the future; what’s your retirement plan? This could possibly be a start to clear monthly income when it comes time for you to retire, or sell your properties for a large cash out. Security. Protect yourself in the future by always having a place to go. You will always have plan B in the case you need to quickly move for unexpected reasons. Second question: When is good enough, good enough? The best advice I can give you in this area is to do some market research around the area of your home. View online ads in the area, it’s very likely that you will be able to view pictures of available rentals. Take a day to drive around, look for rentals and visit them. Take conscious notes and see what other landlords are offering in your area so that you don’t make the mistake of making unnecessary upgrades. Remember that your tenants will never take care of your property as much as you will. Third question: Do I need a property manager? This question is typically answered by two other questions. Do I have the time to deal with finding the right tenant? Do I have enough knowledge to find the right tenant? They take care of all the advertising for finding the right tenant. They take care of the signing of the leases or rental agreements. They collect the rent for you. Can help you keep track of your finances. Take care of all maintenance repair schedules. Provide a middle man for all legal issues. At the end of the day, the decision should be made entirely by you. If you feel comfortable in taking on the above tasks, then that decision could save you a considerable amount of money. Fourth question: How much do I charge? First and foremost, it is not entirely up to the landlord to set a price. What you need to consider here is to figure out what the market is willing to pay for your rental property in your area. In other words, you don’t set the price, the market does. The only way to really figure this out is to do market research. How much are people in your area willing to pay for a house in your condition? One way you can do this is to do searches on popular home rental websites for similar homes in your area. If your house, for example, is a two bedroom 2 bath home with a garage, search for similar homes and call the landlord to ask for additional amenities, typically the same ones you’re offering. This will give you a solid going rate for similar homes and then you can make your decision from there. One thing to keep in mind is that you may want to play with this price a little to find the perfect fair market value for your home. Fifth question: What’s a fair security deposit amount? First thing to get out of the way is the fact that this is a deposit, and not a fee. Keep this money separate from your finances and should only be made available to you in the case you need to cover damages made by the tenant once he or she moves out. They must receive the full or remaining amount when the lease has expired or other arrangements have been made for them to move out. This number is entirely up to you, but is important to note that some states limit this amount to X amount of month’s rent. The most typical application of the security deposit is to charge one month’s rent, but can be increased to two or three month’s rent in the case you see something suspicious in their background report that worries you. 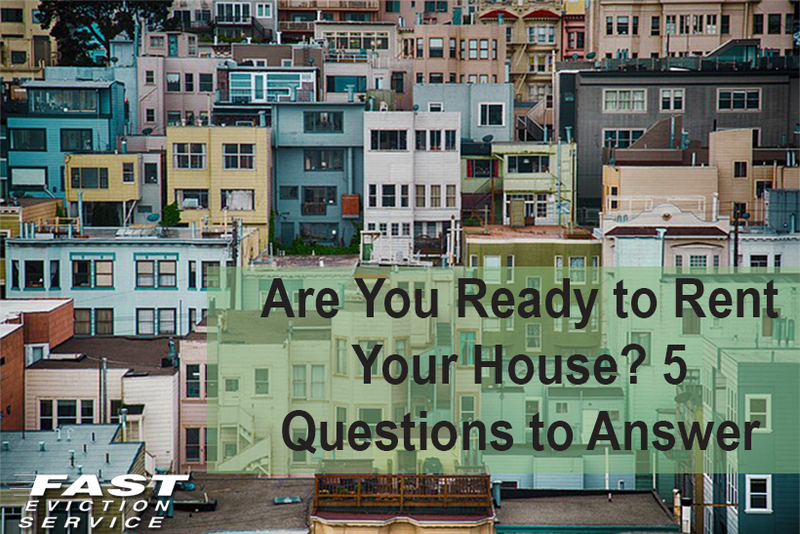 Answering these important 5 questions can persuade you in making your final decision on whether you should sell or rent your house. The most important thing to remember is to do your research, read about other experienced landlords and take their advice. Take the best and the worst and keep it in mind to make your final decision.